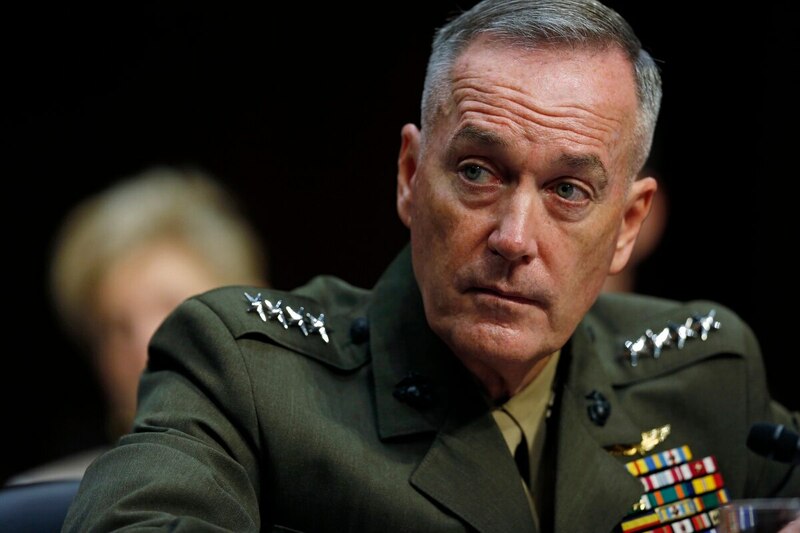 WASHINGTON -- All transgender U.S. servicemembers will continue to be treated with respect, but DOD will eventually implement President Donald Trump’s policy which may ban their service, Chairman of the Joint Chiefs Gen. Joseph F. Dunford said Thursday. Trump announced the policy change in a series of Tweets Wednesday saying that he would no longer allow transgender personnel to join or continue serving in the military. But the White House has not yet communicated the specifics of that new policy to the Pentagon, which will have to issue implementation guidance to the services. The Tweets caught most of the Defense Department by surprise, leaving commanders scrambling to explain what the shift meant for currently serving forces. The current policy, set in October 2016, allows transgender service members to serve openly and allows for DoD-funded gender reassignment surgery. The policy was put in place by former Secretary of Defense Ash Carter under the Obama administration. In a briefing Thursday with Baghdad-based Operation Inherent Resolve spokesman Col. Ryan Dillon, he said that the downrange forces had not yet received guidance on the new policy. Dillon said he also did not know how many, if any transgender forces were currently involved in the fight against the Islamic State. “I don’t know how many and I don’t know if they’ve been told,” Dillon said. Army Secretary Gen. Mark Milley told an audience at the National Press Club that the Army, too, would continue to respect all servicemembers and await implementation guidance from Mattis.